Decision (EU) 2017/1324 of the European Parliament and of the Council (2) provides for the participation of the Union in the Partnership for Research and Innovation in the Mediterranean Area (‘PRIMA’) jointly undertaken by several Member States. The Republic of Lebanon (‘Lebanon’) expressed its wish to join PRIMA as a Participating State and on an equal footing with the Member States and third countries associated to Horizon 2020 — the Framework Programme for Research and Innovation (2014-2020) participating in PRIMA. In accordance with Article 1(2) of Decision (EU) 2017/1324 Lebanon is to become a Participating State in PRIMA subject to the conclusion of an international agreement for scientific and technological cooperation with the Union setting out the terms and conditions for the participation of Lebanon in PRIMA. In accordance with Council Decision (EU) 2018/467 (3) the Agreement for scientific and technological cooperation between the European Union and the Republic of Lebanon setting out the terms and conditions for the participation of the Republic of Lebanon in the Partnership for Research and Innovation in the Mediterranean Area (PRIMA) (‘the Agreement’), was signed on 27 February 2018, subject to its conclusion at a later date. The Agreement for scientific and technological cooperation between the European Union and the Republic of Lebanon setting out the terms and conditions for the participation of the Republic of Lebanon in the Partnership for Research and Innovation in the Mediterranean Area (PRIMA) is hereby approved on behalf of the Union (4). The President of the Council shall, on behalf of the Union, give the notification provided for in Article 5(2) of the Agreement (5). Done at Brussels, 28 May 2018. (1) Consent of 17 April 2018 (not yet published in the Official Journal). (2) Decision (EU) 2017/1324 of the European Parliament and of the Council of 4 July 2017 on the participation of the Union in the Partnership for Research and Innovation in the Mediterranean Area (PRIMA) jointly undertaken by several Member States (OJ L 185, 18.7.2017, p. 1). (3) Council Decision (EU) 2018/467 of 25 September 2017 on the signing, on behalf of the Union, and provisional application of the Agreement for scientific and technological cooperation between the European Union and the Republic of Lebanon setting out the terms and conditions for the participation of the Republic of Lebanon in the Partnership for Research and Innovation in the Mediterranean Area (PRIMA) (OJ L 79, 22.3.2018, p. 1). (4) The Agreement has been published in OJ L 79, 22.3.2018, p. 3, together with the decision on signature. (5) The date of entry into force of the Agreement will be published in the Official Journal of the European Union by the General Secretariat of the Council. On 23 March 2012 the Council adopted Regulation (EU) No 267/2012. In accordance with Article 46(7) of Regulation (EU) No 267/2012, the Council has reviewed the list of designated persons and entities set out in Annexes IX and XIV to that Regulation. The Council has concluded that the entries concerning certain persons and entities included in Annex IX to Regulation (EU) No 267/2012 should be updated. Annex IX to Regulation (EU) No 267/2012 is amended as set out in the Annex to this Regulation. Done at Luxembourg, 4 June 2018. (1) OJ L 88, 24.3.2012, p. 1. Acting on behalf of Yasa Part. Involved in procurement of materials that are controlled and have direct application in the manufacture of centrifuges for Iran's uranium enrichment programme. Involved in the production and supply of specialist electrical equipment and materials that have a direct application in the Iranian nuclear sector. Former MODAFL Deputy for Inspection, responsible for all MODAFL facilities and installations, who remains associated with, including through the provision of services to, MODAFL and the IRGC. Deputy Commander of IRGC for Cultural and Social Affairs. Former Commander of Basij Resistance Force. Former Commander of Khatam al-Anbiya. Recital (6) of Commission Delegated Regulation (EU) 2015/68 (2) anticipates that the Commission assesses the requirement to fit anti-lock braking systems (ABS) on tractors with maximum design speed between 40 km/h and 60 km/h as of 1 January 2020. Following an assessment of that requirement, the Commission concluded that removing the ABS requirement from the Delegated Regulation for those vehicles avoids disproportionate financial costs for the industry and the users, which would ultimately delay the effective use of state-of-the-art braking technology on the market. Therefore, the requirement to fit ABS on those vehicles should be deleted. The conditions of operation of high pressure energy storage devices should allow for the state-of-the-art pressure range and provide for the corresponding test. The pressure limit values should therefore be adapted accordingly. In order to allow for a smooth transition to the prohibition of hydraulic connections of the single-line type, for the Member States and the industry, when applying the braking requirements of Delegated Regulation (EU) 2015/68 to new tractors connected with trailers already in service, taking into consideration the renewal rate of the agricultural and forestry towed vehicles fleet, the application of the transitional requirements on the single-line type hydraulic connections of braking devices and trailer braking couplings should be extended until 31 December 2024. Delegated Regulation (EU) 2015/68 should therefore be amended accordingly. 1. The performance requirements applying to hydraulic connections of the single-line type of braking devices and trailer braking couplings and to tractors fitted with hydraulic connections of the single-line type are laid down in Annex XIII. Those requirements shall apply until 31 December 2024. Annexes I, IV and XIII to Delegated Regulation (EU) 2015/68 are amended in accordance with the Annex to this Regulation. Done at Brussels, 15 February 2018. (2) Commission Delegated Regulation (EU) 2015/68 of 15 October 2014 supplementing Regulation (EU) No 167/2013 of the European Parliament and of the Council with regard to vehicle braking requirements for the approval of agricultural and forestry vehicles (OJ L 17, 23.1.2015, p. 1). This low pressure in the hydraulic energy storage devices shall not exceed 11 500 kPa for systems using energy storage devices with a maximum operational pressure of 15 000 kPa. This low pressure in the hydraulic energy storage devices may exceed 11 500 kPa for systems using energy storage devices which are charged to a maximum operational pressure exceeding 15 000 kPa to comply with the prescribed braking performance.’. In case of systems using energy storage devices that are charged to a maximum operational pressure exceeding 15 000 kPa to comply with the requirements of the prescribed braking performance, the pressure in the energy storage devices at the beginning of the test shall be the maximum pressure provided for by the manufacturer.’. In the case that a control line and a supplementary line of a towed vehicle are connected, the pressure pm generated shall be in accordance with Diagram 2 of Appendix 1 to Annex II. In the case that a towed vehicle with a hydraulic connection of the single-line type is connected, the pressure pm generated shall be in accordance with point 2 or 3 of this Annex. Detection of connected lines in points 1.1.1 and 1.1.2 shall be done by automatic means.’. UNECE regulations which apply on a compulsory basis set out in Annex I to Commission Delegated Regulation (EU) 2015/208 (2) are updated frequently. In that regard, the list should be complemented with an explanatory note clarifying that manufacturers are allowed to use subsequent supplements of the applicable series of amendments of those UNECE regulations, even if they are not published in the Official Journal of the European Union. Certain editorial errors in the list of UNECE regulations set out in Annex I to Delegated Regulation (EU) 2015/208 need to be corrected. Editorial improvements to Annex IV to Delegated Regulation (EU) 2015/208 and precise references to vehicle categories to which that Annex applies are necessary for the smooth implementation by national authorities. The requirements on steering laid down in Annex V to Delegated Regulation (EU) 2015/208 need to be adapted to technical progress in line with the standard ISO 10998:2008 and with the requirements laid down in UNECE Regulation No 79, which is included in the list set out in Annex I to Delegated Regulation (EU) 2015/208. Modern agricultural and forestry vehicles are exposed to electromagnetic signals the frequency of which is up to 2 000 MHz. Therefore, Annex XV to Delegated Regulation (EU) 2015/208 should be amended to include the appropriate frequency ranges for testing and to be aligned with UNECE Regulation No 10, which includes such testing requirements and applies as an alternative to the requirements laid down in Annex XV. Modern farming techniques require the use of wider tyres to avoid soil compaction as well as the use of bigger tools. Therefore, the requirements on dimensions and trailer masses laid down in Annex XXI to Delegated Regulation (EU) 2015/208 need to be adapted as regards the vehicle width in line with what is already allowed in a number of Member States. The adaptation of the dimensions requirements entails the need to adapt some of the requirements laid down in the Annexes to Delegated Regulation (EU) 2015/208, namely Annex VII on the field of vision and windscreen wipers, Annex XII on lighting installation, Annex XIV on vehicle exterior and accessories, Annex XXVI on rear protective structures, Annex XXVII on lateral protection and Annex XXVIII on load platforms, as their provisions directly depend on the permissible vehicle width. It is estimated that fatal accidents may be considerably reduced by increasing the conspicuity of agricultural and forestry vehicles by adapting the requirements for appropriate enhanced lighting installations in Annex XII to Delegated Regulation (EU) 2015/208. In order to allow for the correct application of the testing requirements laid down in Annex XXXIV to Delegated Regulation (EU) 2015/208, it is necessary to update a certain mathematical formula related to such testing. In order to ensure the safeguarding of road safety, with respect to trailers and interchangeable towed equipment to which Regulation (EU) No 167/2013 applies, the requirements for mechanical couplings in Annex XXXIV to Delegated Regulation (EU) 2015/208 should be adapted to allow for the use of 3-point mechanical couplings and improved specifications for mechanical couplings on towed vehicles towing other vehicles should be introduced. Delegated Regulation (EU) 2015/208 should therefore be amended and corrected accordingly. 1. Notwithstanding the application of the provisions of this Regulation, as amended by Commission Delegated Regulation (EU) 2018/829 (*1), national authorities shall, until 31 December 2018, also continue to grant type-approvals to agricultural and forestry vehicle types, or types of systems, components or separate technical units in accordance with this Regulation, in its version applicable on 8 June 2018. 2. Notwithstanding the application of the provisions of this Regulation, as amended by Delegated Regulation (EU) 2018/829, the Member States shall, until 30 June 2019, also permit the placing on the market, registration or entry into service of agricultural and forestry vehicles, systems, components or separate technical units based on a type approved in accordance with this Regulation, in its version applicable on 8 June 2018. (*1) Commission Delegated Regulation (EU) 2018/829 of 15 February 2018 amending and correcting Delegated Regulation (EU) 2015/208 supplementing Regulation (EU) No 167/2013 of the European Parliament and of the Council with regard to vehicle functional safety requirements for the approval of agricultural and forestry vehicles (OJ L 140, 6.6.2018, p. 8).’;"
Annexes I, V, VII, XII, XIV, XV, XXI, XXVI, XXVII, XXVIII and XXXIV are amended in accordance with Annex I to this Regulation. Annexes I, IV, XII and XXXIV to Delegated Regulation (EU) 2015/208 are corrected in accordance with Annex II to this Regulation. (2) Commission Delegated Regulation (EU) 2015/208 of 8 December 2014 supplementing Regulation (EU) No 167/2013 of the European Parliament and of the Council with regard to vehicle functional safety requirements for the approval of agricultural and forestry vehicles (OJ L 42, 17.2.2015, p. 1). Mandatory on vehicles with a total width of more than 2,55 m.
The width may be increased up to 3,00 m if this is solely caused by the installation of tyres, rubber tracks or dual tyre configurations, necessary for soil protection, including spray suppression systems, provided that the width of the vehicle permanent structure is limited to 2,55 m and the type-approved vehicle is also fitted with at least one set of tyres or rubber tracks for which its width may not exceed 2,55 m.
width: 2,55 m (ignoring the deflected part of the tyre walls at the point of contact with the ground). (*1) Directive 2006/42/EC of the European Parliament and of the Council of 17 May 2006 on machinery, and amending Directive 95/16/EC (recast) (OJ L 157, 9.6.2006, p. 24).’;"
Where a towed vehicle tows another towed vehicle, the mechanical coupling of the former shall comply with the requirements on mechanical couplings for tractors.’. The requirements of ISO 10998:2008, Amd 1 2014 shall apply to the steering of vehicles belonging to categories Tb and Cb with maximum design speed exceeding 40 km/h and not exceeding 60 km/h. The steering action of Cb tractors shall be in accordance with the requirements laid down in point 3.9 of Annex XXXIII. The requirements on steering effort for the vehicles referred to in points 1 shall be the same as the requirements for vehicles of N2 category set out in section 6 of UNECE Regulation No 79 as referenced in Annex I.
interchangeable towed equipment of category R1a or R2a intended mainly to process materials within the meaning of Article 3(9) of Regulation (EU) No 167/2013;’. Several entries of Annex I to Regulation (EU) No 167/2013 should be amended to permit laying down requirements for additional vehicle categories in accordance with the latest versions of certain standard Codes for the official testing of agricultural and forestry tractors of the Organisation for Economic Cooperation and Development (OECD standard Codes) (2). UNECE regulations which apply on a compulsory basis set out in Annex I to Commission Delegated Regulation (EU) No 1322/2014 (3) are updated frequently. In that regard, the list should be complemented with an explanatory note clarifying that manufacturers are allowed to use subsequent supplements of the applicable series of amendments of those UNECE regulations, even if they are not published in the Official Journal of the European Union. To make clear that certain requirements of Union legislation are equivalent and fully aligned with the requirements set out in the OECD standard Codes, the text of the requirements and the numbering set out in certain Annexes to Delegated Regulation (EU) No 1322/2014 should be adapted to make them identical with the text and numbering of the corresponding OECD standard Code. To reduce the number of injuries and fatal accidents caused by the failure to raise the rear – mounted foldable roll-over protection structure on narrow-track tractors in potentially dangerous situations, ergonomic requirements should be made compulsory to facilitate and encourage the raising of the roll-over protection structure when needed. The list of test reports issued on the basis of the OECD standard Codes and recognised for the purposes of EU type approval as an alternative to the test reports issued on the basis of Delegated Regulation (EU) No 1322/2014 should be brought up to date. For the purposes of clarifying and improving certain test procedures, additional minor amendments should be made to the test method for the driver's seat and to the requirements on access to the driving position, on the minimum strength of control devices and on the burning rate of cab material set out in Delegated Regulation (EU) No 1322/2014. In Annex I to Regulation (EU) No 167/2013, in row No 38, in the columns for vehicle categories Ca and Cb, ‘NA’ is replaced by ‘X’. 1. Until 26 June 2018, national authorities shall continue to grant type-approvals to agricultural and forestry vehicle types, or types of systems, components or separate technical units in accordance with this Regulation, in its version applicable on 25 June 2018. The burning rate of cab interior material such as the seat covering, wall, floor and headliner coverings when provided shall not exceed the maximum rate of 150 mm/min when tested in accordance with the standard ISO 3795:1989 or the standard FMVSS302.’. Done at Brussels, 9 March 2018. (3) Commission Delegated Regulation (EU) No 1322/2014 of 19 September 2014 supplementing and amending Regulation (EU) No 167/2013 of the European Parliament and of the Council with regard to vehicle construction and general requirements for the approval of agricultural and forestry vehicles (OJ L 364, 18.12.2014, p. 1). ‘The vertical distance between the centre of the front-axle pivot point to the centre of axle of the front tyres or tracks (H01 ) shall be included in the manufacturer's technical report and shall be checked. The minimum rear track width fitted with tyres or tracks of the largest size, as specified by the manufacturer, shall be measured (Figure 6.9). Unless the numbering of sections B2 and B3 which has been harmonised with the whole Annex, the text of the requirements and the numbering set out in point B are identical with the text and numbering of the OECD standard Code for the official testing of front mounted roll-over protective structures on narrow-track agricultural and forestry tractors, OECD standard Code 6, Edition 2017 of February 2017.’. This Section provides minimum performance and tests requirements for rear mounted foldable ROPS which are raised and/or lowered manually by a standing operator (with or without partial assistance) and locked manually or automatically. ‘place to stand’ is a place on the tractor platform accessible from the driving position main access with sufficient space for a standing operator. The manual handling shall be done by a standing operator with one or more grasps on grasping area of the roll-bar. The roll-bar can be handled from the ground or from a place to stand on the platform (Figures 7.8a and 7.8b). The operator can handle the roll-bar in parallel with or in front of its trajectory. A multiple step process with multiple operator positions and multiple defined grasping areas is allowed. The grasping area shall be clearly and permanently identified (Figure 7.9). This area has to be designed without sharp edges, sharp angles and rough surfaces likely to cause injury to the operator. This area could be on one or both sides of the tractor and could be a structural part of the roll-bar or additional handles. In this grasping area the manual handling to raise or lower the roll-bar shall not create shearing, pinching or uncontrollable movement hazards to the operator. 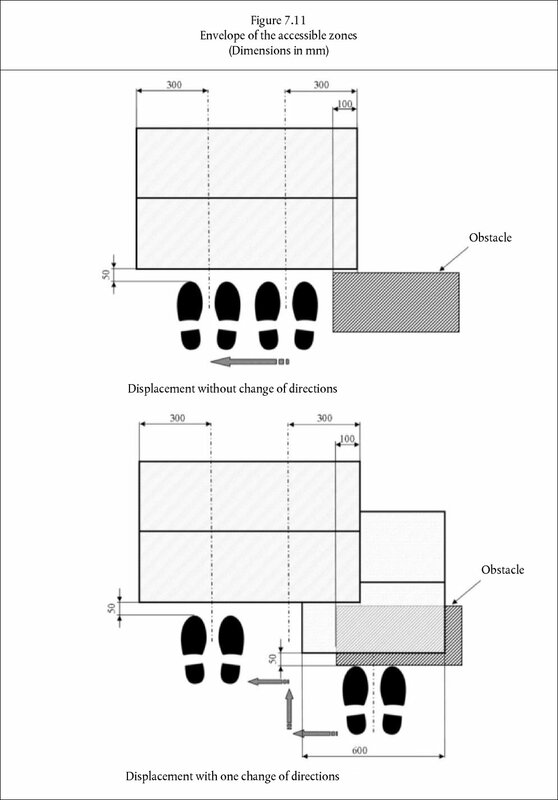 Three accessible zones with different amount of allowed force are defined with respect to horizontal plane of the ground and the vertical planes tangent to the outer parts of the tractor that limit the position or the displacement of the operator (Figure 7.10). The position and the movement of the operator are limited by obstacles. These are parts of the tractor and are defined by vertical planes tangent to the external edges of the obstacle. 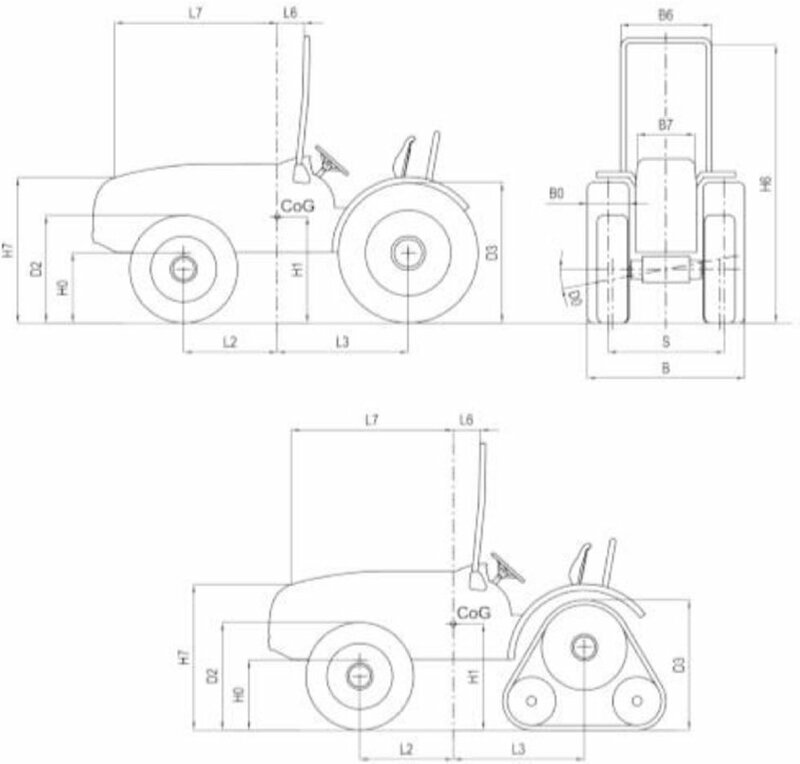 If the operator needs to move the feet during the manual handling of the roll-bar a displacement is allowed either within a parallel plane to the roll-bar trajectory or within just one more parallel plane to the previous one so as to overcome an obstacle. The overall displacement shall be considered as a combination of straight lines parallel and perpendicular to the roll-bar trajectory. A perpendicular displacement is accepted provided that the operator comes closer to the roll-bar. 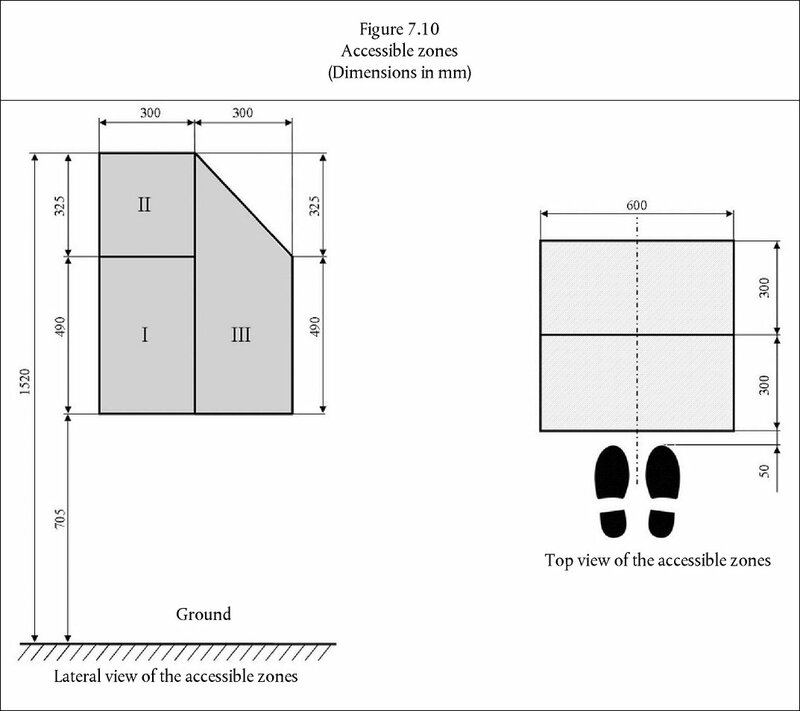 The accessible area shall be considered as the envelope of the different accessible zones (Figure 7.11). Only for handling of the roll-bar in front of its trajectory are considered as accessible extensions of the zone II and zone III (Figure 7.12). In these extensions the acceptable actuation forces are the same ones as respectively in zone II and in the zone III. If the operator needs to move during the manual handling of the roll-bar it must be done so by a displacement without any obstacle within a plane parallel to the roll-bar trajectory. In this case the accessible area shall be considered as the envelope of the different accessible zones. A place provided for standing shall have sufficient space for both of the operator's feet, be flat and have a slip-resistant surface. Depending on the machine configuration, it may consist of two separate surfaces and may use machine components. It shall be positioned so that the operator can maintain stability while carrying out the service required and be on the same height level with a tolerance of ± 50 mm. Handhold(s) and/or railings shall be provided in order to allow three-point contact. Parts of the machine can be considered to fulfil this requirement. 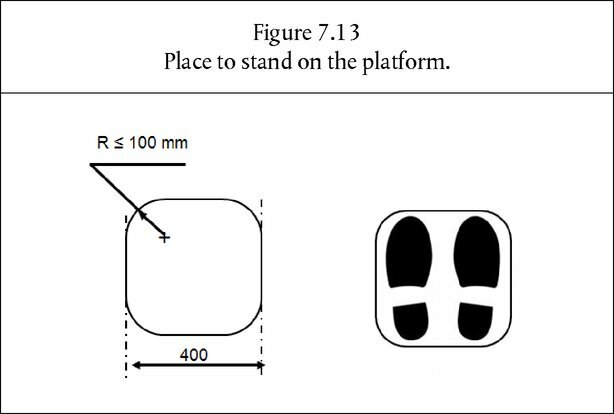 It is considered that a place for standing has sufficient space if its surface is at least a square in cross section of 400 mm per side (Figure 7.13). Alternatively the place to stand requirement may be met by providing sufficient space for one foot on a flat surface and one knee on the seat. The tractor must be fitted with tyres having the greatest diameter indicated by the manufacturer and the smallest cross-section for tyres of that diameter. The tyres must be inflated to the pressure recommended for field work. The rear wheels must be set to the narrowest track width; the front wheels must be set as closely as possible to the same track width. If it is possible to have two front track settings which differ equally from the narrowest rear track setting, the wider of these two front track settings must be selected. The aim of the test is to measure the force necessary to raise or lower the roll-bar. The test will be carried out in static condition: no initial movement of the roll-bar. Each measurement of the force necessary to raise or lower the roll-bar shall be made in a direction tangent to the trajectory of the roll-bar and passing through the geometric centre of cross sections of the grasping area. 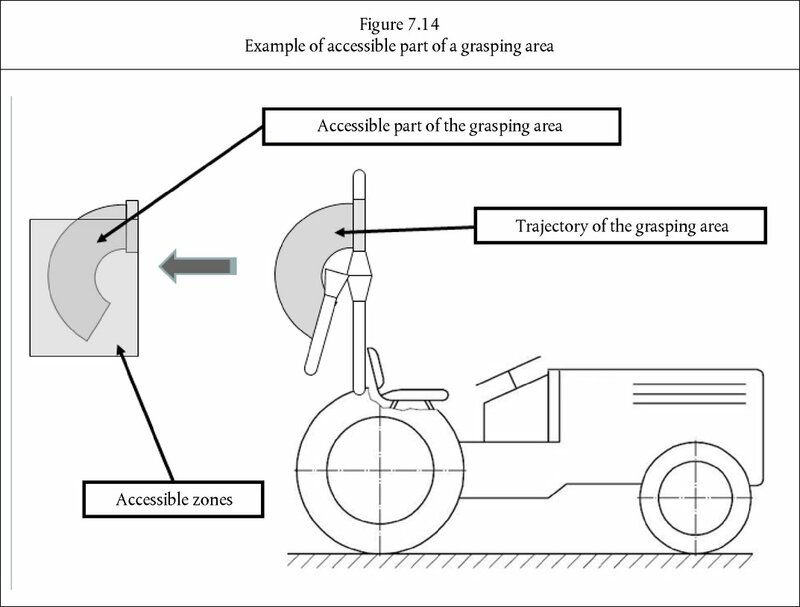 The grasping area is considered accessible when located within the accessible zones or the envelope of different accessible zones (Figure 7.14). The force necessary to raise and lower the roll-bar shall be measured in different points that are within the accessible part of the grasping area (Figure 7.15). 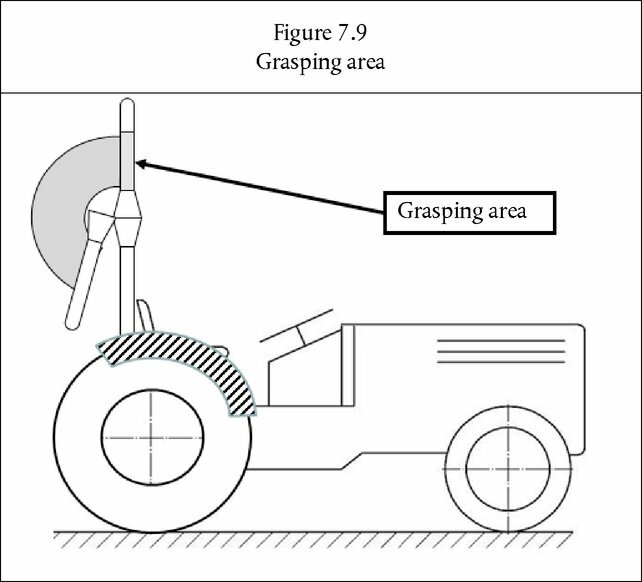 The first measure is carried out at the extremity of the accessible part of the grasping area when the roll-bar is fully lowered (Point 1 in Figure 7.15). The second measure is defined according to the position of Point 1 after rotation of the roll-bar up to the point where the perpendicular to the trajectory of the roll-bar is vertical (Point 2 in Figure 7.15). The third measure is carried out after rotation of the roll-bar up to the top of the accessible part of the grasping area (Point 3 in Figure 7.15). If in this third measure the roll-bar is not fully raised, a point shall be measured at the extremity of the accessible part of the grasping area when the roll bar is fully raised (Point 4 in Figure 7.15). 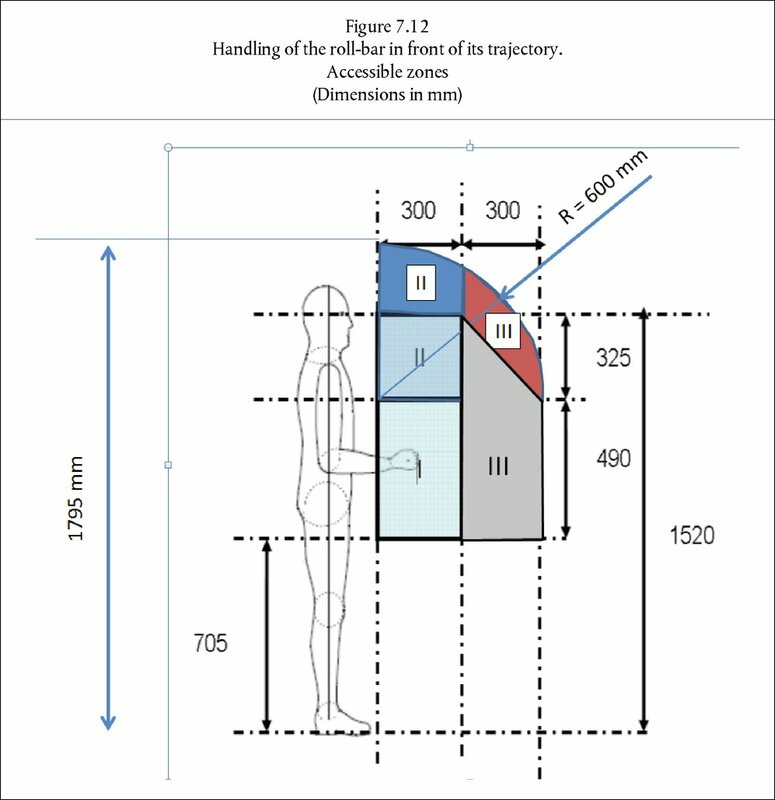 If between point 1 and point 3 the trajectory of extremity of the accessible part of the grasping area crosses the limit between Zone I and Zone II an additional measurement shall be made at this point (Figure 7.16). The maximum forces in these points shall not exceed the acceptable force of the zone (I, II or III). In order to measure the force in the required points, it is possible either to measure directly the value or to measure the torque needed to raise or lower the roll-bar so as to calculate the force. 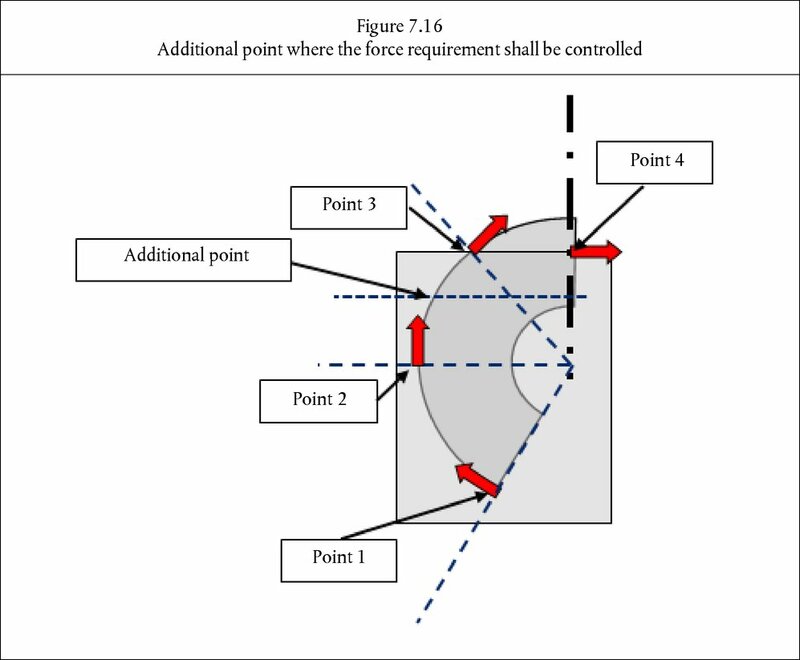 The force acceptable for the actuation of the ROPS depends on the accessible zone as shown in Table 7.2. An increase of no more than 25 % of these acceptable forces is allowed when the roll-bar is fully lowered and fully raised. An increase of no more than 25 % of these acceptable forces is allowed if the roll-bar is handled in front of its trajectory. An increase of no more than 50 % of these acceptable forces is allowed in the lowering operation. The manual handling to raise or lower the roll-bar shall not create shearing, pinching or uncontrollable movement hazards to the operator. A pinching point is not considered dangerous for the operator hands part if in the grasping area the safety distances between the roll-bar and fixed parts of the tractor are no less than 100 mm for hand, wrist, fist and 25 mm for finger (ISO 13854:1996). The safety distances shall be checked with respect to the mode of handling foreseen by the manufacturer in the operator's manual. to avoid unintentional removing or losing of parts. If the devices employed to lock the ROPS in the upright/lowered position are pins they shall be inserted or removed freely. 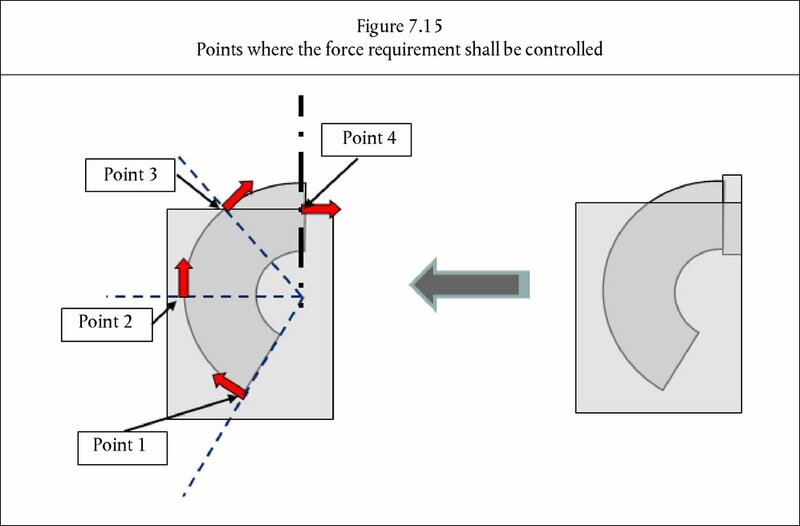 If to do so there is a need to apply a force on the roll-bar this shall comply with the requirements of points 1 and 3 or 4 (see point 5.3). For all other locking devices, they shall be engineered according to an ergonomic approach for what concerns the shape and the force especially avoiding pinching or shearing hazards. An automatic locking system fitted on hand-operated foldable ROPS has to be submitted to a preliminary test before the ROPS strength test. The roll-bar shall be moved from the lower position to the upright locked position and back. These operations correspond to one cycle. 500 cycles shall be completed. This could be done manually or with the use of external energy (hydraulic, pneumatic or electric actuators). In both cases the force shall be applied within a plane parallel to the trajectory of the roll-bar and passing through the grasping area, the angular speed of the roll-bar shall be roughly constant and less than 20 deg/s. After the 500 cycles, the force applied when the roll-bar is in the upright position shall not exceed by more than 50 % the allowed force (Table 7.2). The unlocking of the roll-bar shall be done following the operator manual. After the completion of the 500 cycles there shall be no maintenance or adjustment on the locking system. Note 1: The preliminary test could be applied to automatic foldable ROPS systems as well. The test should be carried out before the ROPS strength test. Note 2: The preliminary test could be carried out by the manufacturer. In such a case the manufacturer shall provide the test station with a certificate stating that the test has been done according the test procedure and that there was no maintenance or adjustment on the locking system after the completion of the 500 cycles. The test station will check the performance of the device with one cycle from the lower position to the upright locked position and back. Handling of the roll-bar in front of its trajectory. Place to stand on the platform. Unless the numbering of sections B2 and B3 which has been harmonised with the whole Annex, the text of the requirements and the numbering set out in point B are identical with the text and numbering of the OECD standard Code for the official testing of rear mounted roll-over protective structures on narrow-track wheeled agricultural and forestry tractors, OECD standard Code 7, Edition 2017 of February 2017.’. In any case, the requirements of point 3.3. shall be fulfilled and a description of the test condition shall be stated in the test report. Throughout the remainder of these rules, reference will only be made to testing the protective structure. It must be understood that this includes cladding not of a temporary nature. Unless otherwise stated, the text of the requirements and the numbering set out in Point C are identical with the text and numbering of the OECD standard Code for the official testing of falling object protective structures on agricultural and forestry tractors, OECD standard Code 10, Edition 2017 of February 2017.’. Annex I to Commission Regulation (EU) No 10/2011 (2) establishes a Union list of authorised substances which may be used in plastic materials and articles intended to come into contact with food. Since the last amendment to Regulation (EU) No 10/2011, the European Food Safety Authority (‘the Authority’) has published further scientific opinions on particular substances that may be used in food contact materials (‘FCM’) as well as on the permitted use of already authorised substances. In order to ensure that Regulation (EU) No 10/2011 reflects the most recent findings of the Authority, that Regulation should be amended. The Authority has adopted opinions re-evaluating perchlorate contamination in foods and human dietary exposure to perchlorate (3) (4). The substance perchloric acid, salts (perchlorate) (FCM No 822) is included as an additive or polymer production aid in Table 1 of Annex I to Regulation (EU) No 10/2011. A specific migration limit (SML) of 0,05 mg/kg applies to that substance on the basis of the conventional dietary exposure assumption from food contact materials that 1 kg of food is consumed daily by a person of 60 kg body weight. In re-evaluations of perchlorate, the Authority established a Tolerable Daily Intake (TDI) of 0,3 μg/kg body weight per day and noted that both the short and long term exposure to perchlorate of young population groups from all food sources exceeded the TDI whereas the short and long term exposure of the adult population was at the level of the TDI. To account for this, the SML should be calculated on the basis of the TDI and a conventional allocation factor of 10 % of the TDI from FCM should be applied. Consequently, the SML of 0,05 mg/kg for perchlorate should be lowered to 0,002 mg/kg to ensure that migration of perchlorate from plastic FCM does not endanger human health. The Authority adopted a favourable scientific opinion (5) on the use of the substance phosphorous acid, mixed 2,4-bis(1,1-dimethylpropyl)phenyl and 4-(1,1-dimethylpropyl)phenyl triesters (FCM substance No 974 and CAS No 939402-02-5). This substance is authorised with a migration limit of 5 mg/kg food. On the basis of new scientific evidence the Authority concluded that this substance is not of a safety concern for the consumer if its specific migration limit is increased from 5 to 10 mg/kg food, where the other existing restrictions are still met. Therefore the migration limit of this substance should be increased from 5 to 10 mg/kg, provided the other restrictions are retained. The Authority adopted a favourable scientific opinion (6) on the use of the substance 1,2,3,4-tetrahydronaphthalene-2,6-dicarboxylic acid, dimethyl ester (FCM substance No 1066 and CAS No 23985-75-3). The Authority concluded that the substance is not of a safety concern for the consumer if used as a co-monomer for the manufacture of a polyester layer intended to be used as an inner layer in a plastic multilayer material intended for contact with foods for which food simulants A, B, C and/or D1 are assigned in Table 2 of Annex III to Regulation (EU) No 10/2011. The migration of the sum of the substance and its dimers (cyclic and open chain) should not exceed 0,05 mg/kg food. That monomer should therefore be included in the Union list of authorised substances with the restriction that these specifications should be met. The Authority adopted a favourable scientific opinion (7) on the use of the substance [3-(2,3-epoxypropoxy)propyl]trimethoxy silane (FCM substance No 1068, CAS No 2530-83-8). The Authority concluded that although the substance has genotoxic potential, it is not of safety concern due to its low exposure, if any, when used as a component of sizing agents to treat glass fibres imbedded in low diffusivity plastics such as in polyethylene terephthalate (PET), polycarbonate (PC), polybutylene terephthalate (PBTP), thermoset polyesters, and epoxy bisphenol vinyl ester intended for single and repeated use with long-term storage at room temperature, short-term repeated contact at increased or high temperature and for all foods. As some of the reaction products of the substance containing the epoxy function may also have a genotoxic potential, the residues of the substance and of each of the reaction products in the treated glass fibres should not be detectable at 10 μg/kg for the substance and 60 μg/kg for each of the reaction products (hydrolysed monomers and epoxy-containing cyclic dimer, trimer and tetramer). Annex I to Regulation (EU) No 10/2011 should therefore be amended accordingly. Annex I to Regulation (EU) No 10/2011 is amended in accordance with the Annex to this Regulation. Plastic materials and articles complying with Regulation (EU) No 10/2011 as applicable before the entry into force of this Regulation, may be placed on the market until 26 June 2019 and may remain on the market until exhaustion of stocks. Done at Brussels, 5 June 2018. (1) OJ L 338, 13.11.2004, p. 4. (2) Commission Regulation (EU) No 10/2011 of 14 January 2011 on plastic materials and articles intended to come into contact with food (OJ L 12, 15.1.2011, p. 1). Only to be used as a co-monomer in the manufacture of a polyester non-food contact layer in a plastic multilayer material, which is to be used only in contact with foods for which food simulants A, B, C and/or D1 are assigned in Table 2 of Annex III. The specific migration limit in column 8 refers to the sum of the substance and of its dimers (cyclic and open chain). Only to be used as a component of a sizing agent to treat glass fibres to be embedded in glass-fibre-reinforced low diffusivity plastics (polyethylene terephthalate (PET), polycarbonate (PC), polybutylene terephthalate (PBT), thermoset polyesters and epoxy bisphenol vinylester) in contact with all foodstuffs. For cyantraniliprole, cymoxanil, deltamethrin, fenamidone, folpet, mandestrobin, mepiquat, metazachlor, propamocarb, pyrimethanil, sulfoxaflor and trifloxystrobin, maximum residue levels (MRLs) were set in Annex II to Regulation (EC) No 396/2005. For difenoconazole, flubendiamide, fluopicolide and fosetyl, MRLs were set in Part A of Annex III to that Regulation. For propargite, MRLs were set in Annex V to that Regulation. On 11 July 2015, Codex Alimentarius Commission adopted Codex maximum residue limits (CXLs) for fenamidone (2). In accordance with Article 5(3) of Regulation (EC) No 178/2002 of the European Parliament and of the Council (3), where international standards exist or their completion is imminent, they are to be taken into consideration in the development or adaptation of food law, except where such standards or relevant parts would be an ineffective or inappropriate means for the fulfilment of the legitimate objectives of food law or where there is a scientific justification, or where they would result in a different level of protection from the one determined as appropriate in the Union. Moreover, in accordance with point (e) of Article 13 of that Regulation, the Union is to promote consistency between international technical standards and food law while ensuring that the high level of protection adopted in the Union is not reduced. The Union presented a reservation to the Codex Committee on Pesticides Residues on the CXLs proposed for the following pesticide/product combinations: fenamidone (flowerhead brassicas; fruiting vegetables other than cucurbits). CXLs for fenamidone, which are not listed in recital 4, should therefore be included in Regulation (EC) No 396/2005 as MRLs except where they relate to products which are not set out in Annex I to that Regulation or where they are set at a lower level than the current MRLs. Those CXLs are safe for consumers in the Union (4). In the context of a procedure for the authorisation of the use of a plant protection product containing the active substance cymoxanil on beans without pods, an application was submitted in accordance with Article 6(1) of Regulation (EC) No 396/2005 for modification of the existing MRLs. As regards deltamethrin, such an application was submitted for kale. As regards difenoconazole, such an application was submitted for ‘other flowering brassica’, Brussels sprouts, escaroles, rocket, ‘spinaches and similar leaves’, witloof and rhubarb. As regards fluopicolide, such an application was submitted for chards. As regards folpet, such an application was submitted for apples and pears. As regards fosetyl, such an application was submitted for pome fruits, peaches and potatoes. As regards mandestrobin, such an application was submitted for apricots, cherries, peaches and plums. As regards metazachlor, such an application was submitted for Chinese cabbage. As regards propamocarb, such an application was submitted for chards. As regards pyrimethanil, such an application was submitted for cucurbits with edible peel. As regards sulfoxaflor, such an application was submitted for grape leaves and globe artichokes. As regards trifloxystrobin, such an application was submitted for ‘other small fruits and berries’, ‘lettuces and salad plants’, purslanes, beans without pods, peas and pulses. In accordance with Article 6(2) and (4) of Regulation (EC) No 396/2005 applications were submitted for flubendiamide used in the United States on apricots, peaches, plums and soyabeans, for disodium phosphonate used in the United States on tree nuts (except coconuts) and for propargite used in Brazil on oranges and India on tea. The applicants claim that the authorised uses of those substances on such crops in the respective exporting countries lead to residues exceeding the MRLs contained in Regulation (EC) No 396/2005 and that higher MRLs are necessary to avoid trade barriers for the importation of those crops. In accordance with Article 53 of Regulation (EC) No 1107/2009 of the European Parliament and of the Council (5), on 8 August 2017 the United Kingdom informed the Commission that it has authorised the placing on the market of a plant protection product containing the active substance cyantraniliprole to be used on blackberries and raspberries, due to an unexpected outbreak of Drosophila suzukii. On 13 September 2017, in accordance with Article 53 the United Kingdom informed the Commission of an authorisation of a plant protection product containing the active substance cyantraniliprole for the use on leeks due to an unexpected outbreak of Thrips tabaci, Frankliniella occidentalis, Delia antiqua and Phytomyza gymnostoma. Such authorisations appeared a necessary measure, because the outbreak of those pests constituted a danger that could not be contained by any other reasonable means. The United Kingdom has notified the authorisations to the other Member States, the Commission and the European Food Safety Authority (‘the Authority’) in accordance with Article 18(4) of Regulation (EC) No 396/2005 and submitted applications with a view to setting temporary MRLs for those crops. In accordance with Article 53 of Regulation (EC) No 1107/2009, on 19 September 2017 Greece informed the Commission that it has authorised the placing on the market of a plant protection product containing the active substance mepiquat to be used on cotton as a plant growth regulator. Such authorisation appeared a necessary measure to avoid losses in yield. Greece has notified the authorisation to the other Member States, the Commission and the Authority in accordance with Article 18(4) of Regulation (EC) No 396/2005 and submitted an application with a view to setting a temporary MRL for cotton seeds. In accordance with Article 8 of Regulation (EC) No 396/2005 those applications were evaluated by the Member States concerned and the evaluation reports were forwarded to the Commission. The Authority assessed the applications and the evaluation reports, examining in particular the risks to the consumer and, where relevant, to animals and gave reasoned opinions on the proposed MRLs (6). The Authority forwarded those opinions to the applicants, the Commission and the Member States and made them available to the public. The Authority concluded in its reasoned opinion that, as regards the use of deltamethrin on kale, the risk assessment is affected by non-standard uncertainties. However, considering the low contribution of kale to the overall dietary exposure, it is appropriate to set the MRL at 0,15 mg/kg. As regards trifloxystrobin, the applicant submitted the missing information on analytical methods for products of animal origin and made the reference standard for CGA321113 commercially available. As regards the use of flubendiamide on soyabeans, the current MRL is set at 0,25 mg/kg in the exporting country. Considering that the highest residue measured in supervised field trials is slightly above that value, it is appropriate to set the MRL at a rounded value of 0,3 mg/kg. As regards the use of cyantraniliprole on blackberries, raspberries and leeks, MRLs should be set as temporary valid until 30 June 2021. As regards the use of mepiquat on cotton, the MRL should be set for cotton seeds as temporary valid until 30 June 2021. As regards all other applications, the Authority concluded that all requirements with respect to data were met and that the modifications to the MRLs requested by the applicants were acceptable with regard to consumer safety on the basis of a consumer exposure assessment for 27 specific European consumer groups. The Authority took into account the most recent information on the toxicological properties of the substances. Neither the lifetime exposure to these substances via consumption of all food products that may contain them, nor the short-term exposure due to high consumption of the relevant products showed that there is a risk that the acceptable daily intake or the acute reference dose is exceeded. Based on the reasoned opinions of the Authority and taking into account the factors relevant to the matter under consideration, the appropriate modifications to the MRLs fulfil the requirements of Article 14(2) of Regulation (EC) No 396/2005. Regulation (EC) No 396/2005 should therefore be amended accordingly. Annexes II, III and V to Regulation (EC) No 396/2005 are amended in accordance with the Annex to this Regulation. (1) OJ L 70, 16.3.2005, p. 1. Joint FAO/WHO food standards programme Codex Alimentarius Commission. Appendices III and IV. Thirty-Eight Session. Geneva, Switzerland, 6-11 July 2015. (3) Regulation (EC) No 178/2002 of the European Parliament and of the Council of 28 January 2002 laying down the general principles and requirements of food law, establishing the European Food Safety Authority and laying down procedures in matters of food safety (OJ L 31, 1.2.2002, p. 1). (4) Scientific support for preparing an EU position for the 46th Session of the Codex Committee on Pesticide Residues (CCPR). EFSA Journal 2014;12(7):3737 [182 pp.]. (5) Regulation (EC) No 1107/2009 of the European Parliament and of the Council of 21 October 2009 concerning the placing of plant protection products on the market and repealing Council Directives 79/117/EEC and 91/414/EEC (OJ L 309, 24.11.2009, p. 1). Reasoned opinion on the setting of maximum residue levels for cyantraniliprole in raspberries and blackberries. EFSA Journal 2017;15(11):5061 [24 pp.]. Reasoned opinion on the setting of maximum residue levels for cyantraniliprole in leeks. EFSA Journal 2018;16(1):5124 [24 pp.]. Reasoned opinion on the modification of the existing maximum residue level for cymoxanil in beans without pods. EFSA Journal 2017;15(11):5066 [19 pp.]. Reasoned opinion on the modification of the existing maximum residue level for deltamethrin in kale. EFSA Journal 2018;16(1):4683 [28 pp.]. Reasoned opinion on the modification of the existing maximum residue levels for difenoconazole in various crops. EFSA Journal 2018;16(1):5143[28 pp.]. Reasoned opinion on the setting of import tolerances for flubendiamide in apricots, peaches, nectarines, plums and soya beans. EFSA Journal 2018;16(1):5128 [31 pp.]. Reasoned opinion on the modification of the existing maximum residue level for fluopicolide in chards. EFSA Journal 2018;16(1):5135 [21 pp.]. Reasoned opinion on the Modification of the existing maximum residue levels for folpet in apples and pears. EFSA Journal 2017;15(10):5041 [21 pp.]. Reasoned opinion on the modification of the existing maximum residue levels for fosetyl-Al in tree nuts, pome fruit, peach and potato. EFSA Journal 2018;16(2):5161 [36 pp.]. Reasoned opinion on the modification of the existing maximum residue levels for mandestrobin in apricots, cherries, peaches/nectarines and plums. EFSA Journal 2018;16(1):5148 [22 pp.]. Reasoned opinion on the setting of maximum residue levels for mepiquat chloride in cotton. EFSA Journal 2018;16(2):5162 [25 pp.]. Reasoned opinion on the modification of the existing maximum residue level for metazachlor in Chinese cabbage. EFSA Journal 2018;16(1):5127 [20 pp.]. Reasoned opinion on the modification of the existing maximum residue level for propamocarb in chards/beet leaves. EFSA Journal 2017;15(11):5055 [22 pp.]. Reasoned opinion on the setting of import tolerances for propargite in citrus fruits and tea. EFSA Journal 2018;16(2):5193 [25 pp.]. Reasoned opinion on the modification of the existing maximum residue level for pyrimethanil in cucurbits with edible peel. EFSA Journal 2018;16(2):5145 [20 pp.]. Reasoned opinion on the modification of the existing maximum residue levels for sulfoxaflor in grape leaves and similar species, and globe artichokes. EFSA Journal 2017;15(11):5070 [23 pp.]. Reasoned opinion on the modification of the existing maximum residue levels for trifloxystrobin in various crops. EFSA Journal 2018;16(1):5154 [33 pp. ].